If I get a chance, I’ll try to update this post with graphics and written instructions. For now you have to watch me in the video! A friend of mine forwarded your newsletter to me, I have now signed up for it and have been reading everything I could “click” on! This is all so helpful, especially this info about pruning tomatoes!! Last year was my first sfg and my tomato plants grew TALL and very leafy but very few tomoatoes! Now I know why!! Hopefully this year will be MUCH better! I grew indeterminate when I used my horizontal trellis. Now I use cages. what type of tomatoes do you use for your trellis? Mark–I read that it can spread disease. Michele–if you are going to trellis a plant, you want to prune it from the very beginning. You need to manage how many vines you want it to have. The branches at the bottom are going to grow most vigorously, so if you’ll have only one vine, pinch of every sucker that grows. If you want more, allow the lowest suckers to grow and then prune the rest. You can see what to prune–it’s like a new growing tip coming up between the leaf and the stem. So you will have leaf, leaf, stem with flowers (and later tomatoes) and soon between the leaf and the stem (in the corner of the two) you’ll see a new little growing tip. Space wise, I find that a cherry tomato (one plant) will easily span 4′ of trellis (width wise). My rule of thumb is to grow one vine per square foot. So I prune mine back to about 4 vines. It sounds like you have two tomatoes planted in 4 square feet each, but with sharing a 4′ trellis. In that case, I’d prune to two vines for each tomato. Hope that makes sense! I have tomato plants that have 4 squares each to grow, but they are next to each other in the planter so each will have only 2 squares of trellis space. Do you think that be too crowded for them? Becky–it’s better not to use shears, but you’ll probably be just fine. I pruned my tomato plant by cutting with pruning shears before I read that you are supposed to just break off. Is this going to give my plants a disease? Ooops!! I have not yet tried any season extenders, though they are in my future! I bought walls of water, but so far it’s 5 weeks before I should plant tomatoes and it’s still freezing at night and snowing during the day. I have a hard time believing they will ameliorate these conditions. Hi Emily – did you ever clone tomato stems you pruned? I know how easy it is to get them to grow roots in a jar of water, but will the clones’ maturity be equal to the plant you cut them off? Or would they make good “house pets” in containers if they mature late in the season? Or should I just accept that there is an end to every season and I can’t pick fresh tomatoes year ’round? Also, forgive me if it’s already on your blog and I didn’t find it, but have you used season extenders (such as plastic bottle “greenhouses” or walls of water) on tomatoes and peppers and, if so, did you get an earlier crop? I’m in Colorado; climate is similar to parts of Utah. Halleluia! I’m so happy I found you I could cry. 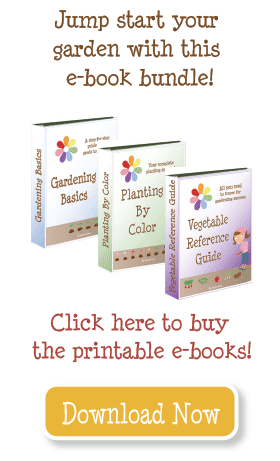 So much confusing info on square foot gardening…Our gardens have always been big sprawly overrun by August, and sometimes disappointing because of all our leaves and heavy soil. We compost every organic thing, but with this family, really heavy on orange peels and egg shells…We started our first worm bed, and hopefully that will grow, too. I finally convinced my husband to work with me on soil composition, and the boxes are in ! So scary to get started, but you are so clear about how many to put per foot etc.!!! so happy about the supplement research you have done, too…we DO get lots of leaves with osmocote etc. Thanks, Emily! I didn’t prune my tomatoes at all this year, and they’re all over the place. (I also waited too long to put cages around them, so some of them are just loose. Whoops! Next year…) I have a ton of green tomatoes, but no reds yet. I may try the tip of stripping the leaves. You will get better tomatoes, if not more. By reducing the energy the plant put into growing the leaves and stem, it redirects it to the fruit. So with regular tomato plants you’ll have bigger, better tomatoes. And something crazy I’ve heard (and will try this year) is that to make them all ripen quickly, strip all the leaves off. It will look naked, but the plant thinks it’s time to RIPEN and put out seeds FAST. I’ve heard that tomatoes do well watered deeply once per week. With Mel’s mix this is not enough (at least not in the hot, dry climate of Utah!) I think every 4 days is probably fine. I know most plants, including tomatoes, don’t like it if it’s REALLY hot, but honestly we have not had that kind of weather this year. Our spring was cold and long, and we haven’t had the 7-10 day stretches of over 100 degrees. I’m more worried about stunted growth from late frosts and storms, and getting those puppies ripened before the fall frost. So do you get a better yield if you prune? I have a very large heirloom plant growing with so far only one tomato growing. I haven’t done much pruning. Will it help? Is it true that tomato plants thrive when watering less frequently and if so, how often do you water? I am in Lehi, I have been watering them about every 4 days minus the awesome rain we have had over the past couple of weeks. Also, I heard that the tomatoes won’t grow if it is too hot, for example if it doesn’t get under 70 degrees at night. Is that true? Great video Emily! Your hair looks so cute! I used to plant 4 tomato plants in 4 squares, and give each 1 foot of trellis to grow up. As you can see by my ONE plant that takes up the ENTIRE trellis, that requires MUCH MUCH more pruning. You can do it, but you can only allow one stem per plant, and prune everything else off. In the end, I found it easier to just grow one plant and let 4 or 5 stems grow. I keep it pruned down to that many, and it works well. My first year I tried one per foot, and I was not happy with the yield. I was much happier when I moved to giving the tomatoes more room by using a horizontal trellis, and this year I tried large tomato cages. I’ll report on that once the season is through! You said that the tomato plant you just prunned in the video was only one plant. Did you give it a 4 foot wide trellis to grow on? If so, why? I thought I should be able to grow 1 tomato plant per square foot with the vertical trellis. Did you find that it is just too crowded?